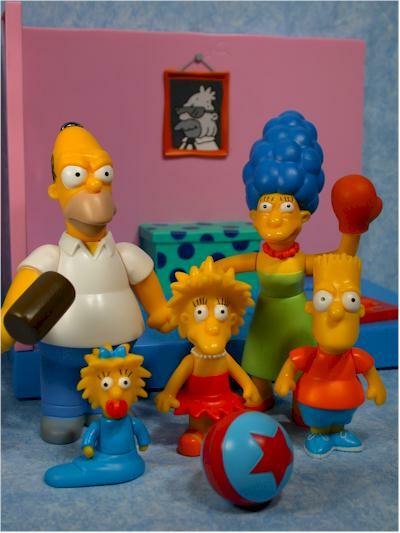 Everyone knows that the Simpsons got their start as short cartoons on the old Tracey Ullman show. These shorts jump started one of the world's most famous, recognizable and iconic television families. But Our Favorite Family certainly looked - and sounded - different than what we've come to love over the decades. Playmates teamed up with FOX and Toys R Us to bring us a retro play set, with figures and designs based on one of the early style. 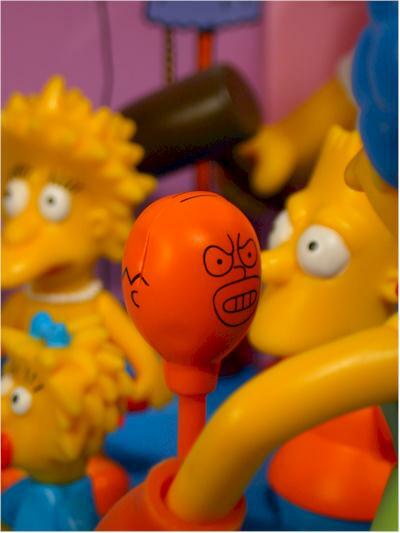 The play set itself is designed around Matt Groening's favorite short entitled "Punching Bag". This short only lasted a little more than a minute. But before you rush off, view it, and rush back here to tell me that the figures don't look the same, I'll beat you to it. The figures don't look the same. That's because the versions of several, especially Maggie and Lisa, are awfully close to the way they look today. This short came later in the run on the Ullman show, and the designs had already begun to change. 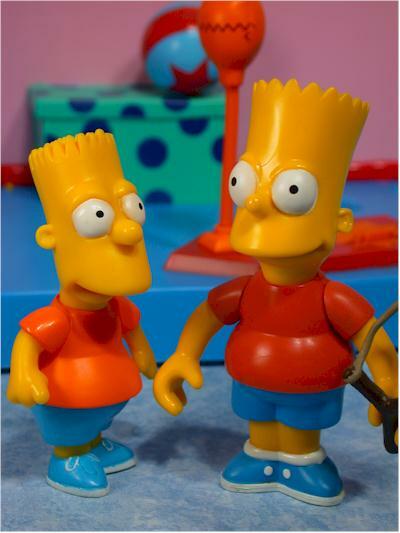 So to keep the set looking interesting and unique, Playmates went with designs for the figures based on much earlier versions. The set is an exclusive to Toys R Us on-line. That's right, you won't find it at your local store, but have to pick it up through Amazon. Retail price is $40, similar to the other recent TRU exclusives, and they are nice enough to have free shipping on this item. 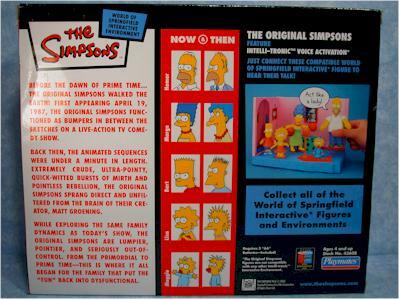 While the box clearly calls this the 'Original Simpsons', the Amazon listing is for the 'Flashback' play set, the original working name for the set. 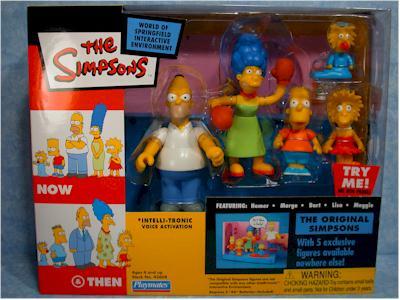 This is the first - and very likely only time - I've ever given a Simpsons toy a perfect packaging score. I'm being a little generous here, but I want to highlight just how cool the box graphics and text are. Both the front and back include photos of the family members 'then and now'. The text on the back is great, although it clearly avoided any direct mention of the Tracey Ullman show, presumable to avoid licensing costs, but it still gives a nice interpretation of the origins. It's not particularly collector friendly, although there aren't any screws to remove. It's sturdy, and the one I received from Amazon had no damage whatsoever in shipping. I suspect some folks will have issues with the character sculpts, and I'll point out where those may be. But for me, this set looks terrific! The play set itself is very, very basic, far more than you've come to expect. More basic than even sets like the DMV, and certainly nothing like the elaborate Comic Book Shop or Kitchen. That's not really the fault of the play set designers though. The living room in this episode was very plain and simple, and this play set followed suit. They did put in extras where they could though, along with the toy box, photos on the walls, and basic surface details. One of the coolest aspects is the 'waviness' of the wall edges, intended to give the impression of the rougher animation of the shorts. Each of the figures has weak points, but overall they managed to capture the essence of the original, goofy, ugly characters. 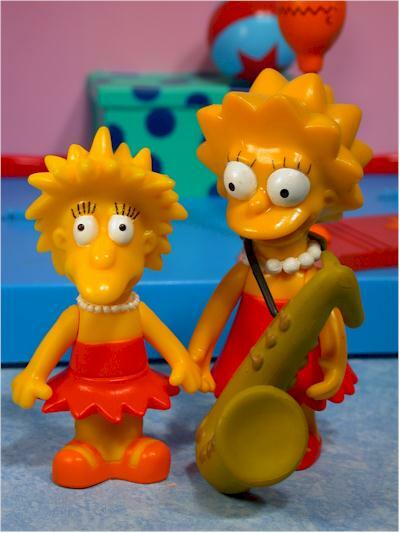 From Homer's pinhead to Lisa's wild spiky hair, they've got it down. I've heard lots of people raving about the Homer, but for me he's got the biggest issues. 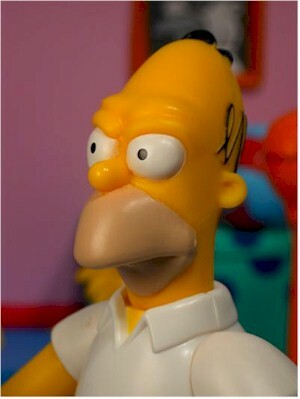 The sculpts on all of these are completely new, but for Homer it's the least obvious. His angry head sculpt has tons of personality, while the body is chunkier, with thicker arms and legs. I really wish they'd gone with a more obvious body change, like the blue suit you see in the 'then and now' photos. The white shirt is just so common that it doesn't make him pop out from the pack as much as the others. 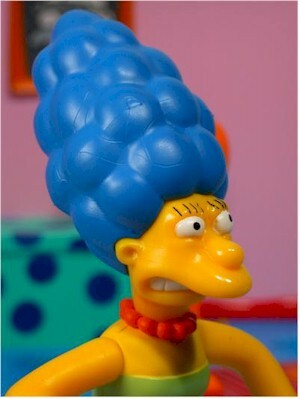 Marge is drastically different, with a heavier, stockier body, and shorter, thicker hair. She has the same elongated face as the rest of the family, and a great scowl, the perfect expression for how she felt while pounding on 'homer'. 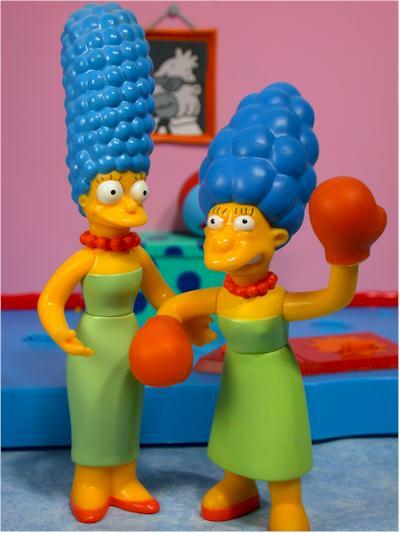 Marge's sculpted pose is also designed intentionally for her to be beating the crap out of the punching bag. Bart, Maggie and Lisa are also very, very different. You might not notice it entirely until you see them side by side with their modern counterparts, but then the changes become tremendously distinct. Both have very different hair, the odd elongated faces, and radically different bodies. The kid figures are all done in 'Database' scale - that is, they are done in a smaller, much more appropriate scale to the adults. Seeing them together makes you realize just how cool it would have been had we gotten properly scaled modern versions all this time, rather than the over sized kids. An interesting trivia point about this set - this is the first regular sized play set with two walls that requires assembly. Main Street has two walls, but is much bigger than usual, and all the other exclusives that have been packaged in pieces had only a single back wall. 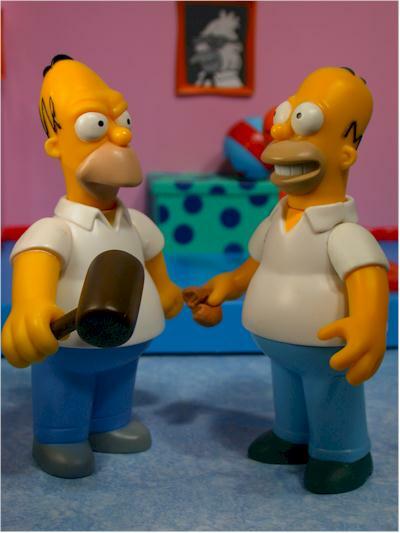 While Homer isn't my favorite version of all time, he certainly is exceptionally spiff, and the overall appearance of the set makes it a Simpsons geek's dream. There are some small, yellow, dots that are actually separate sculpts from the floor along the back wall, on either side of the toy box. There's much debate as to what these are, although both marbles and packing peanuts from getting out the punching bag are possible candidates. The paint ops were solid, although with the rather basic play set there's less of them. The walls and floor are nice and consistent, and the stickers used for the photos and the doorway look great. The paint work on the figures is good, although there's still the occasional bleed and fuzziness between colors. The whites of the eyes on a couple had marks or over spray, but the quality is pretty consistent with the rest of the series. 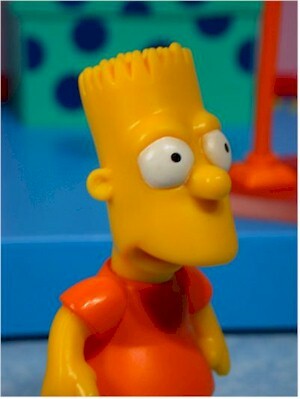 My big complaint here is that Bart has his 'now' colored red shirt, rather than his 'then' colored blue shirt. This was probably the only chance that fans of a blue shirt Bart had of every getting an official one! There's a surprise in the articulation category! Wow, the first time in the entire series that I've actually had anything interesting to say here! And what's that? Well, it's not with Bart, Homer, Marge or Lisa, since they have the same four points as always. But Maggie makes a break from the pack here, or at least from all the previous Maggies. They all just had neck articulation, but this time we actually get all four points - neck, shoulders, and waist! The accessories are a tad light, especially at this price point. I have no amazing suggestions for what else could have been included, but with only the gloves, ball, mallet and punching bag, it feels lacking. However, these items are all new, and the punching bag stands out as an great addition to the set. Homer can hold the mallet well, but I couldn't manage to get any of the kids to hold the big ball. 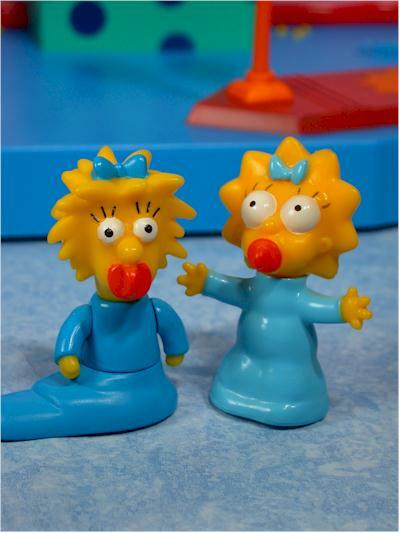 Marge's gloves are also removable and made of a soft rubber. It's a little tougher to get them back on then it is to remove them, but it's doable. The talking feature here is almost perfect. There's a good number of lines, and they are all from the actual short! Homer - "Act like a lady. ", "Do you hear that? The punching bag! ", " Why you little! ", "Get out of the way, step aside boy. ", "Let go Lisa! ", "I can't sleep with that racket. ", "Go tell em to knock it off. ", "I said do it, now move it!" Marge - "They're just playing Homer. ", "I like the punching bag sound. You go tell them if you don't like it. ", "Now play friendly, children." Bart - "But, we don't want to play friendly! ", "Sorry Dad. ", "But, you're a mere girl." Lisa - "We want to play rough! ", "Yeesh, what a grouch." , "Your problem is you're not motivated. ", "Come on Bart, you can punch better than that. Let me try." Maggie - her usual sucking sound. The default is the sound of hitting the punching bag. The fact that all these lines come from the short is a huge plus. But there is a negative. I had that old problem here, where the figures had a tough time making contact and maintaining contact with the pegs in the base. The talking feature is only as good as how well the pegs and slots hook up, and here it wasn't perfect. Hopefully that's not a consistent problem. This set is a much better value than the Centennial set, and even a slightly better value overall than the Treehouse of Horror 4. At $40 and free shipping, you're getting five figures, a full sized play set, and a handful of great accessories. 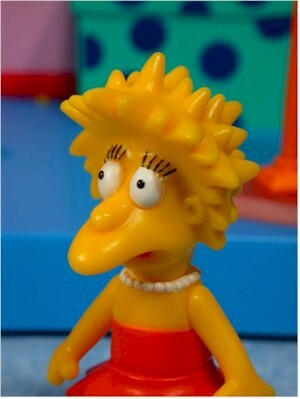 Maggie even has 4 points of articulation! This set is for the serious Simpsons geek. Viewers who care little about the history of the show and the roots of the characters are likely to be put off by the odd designs and weird appearance, but for the diehard fan, this set will be one of the favorites. The major issues I had all related to the fact that they didn't go far enough with the retro look. I wish we'd gotten a Homer body design and a Bart paint scheme more similar to the 'then' pictures on the box, but overall I'm extremely happy with the final product. I couldn't even complain too much about the price! This is a Toys R Us on-line exclusive, so Amazon.com is your only place to pick it up! Or you can search ebay for a deal. 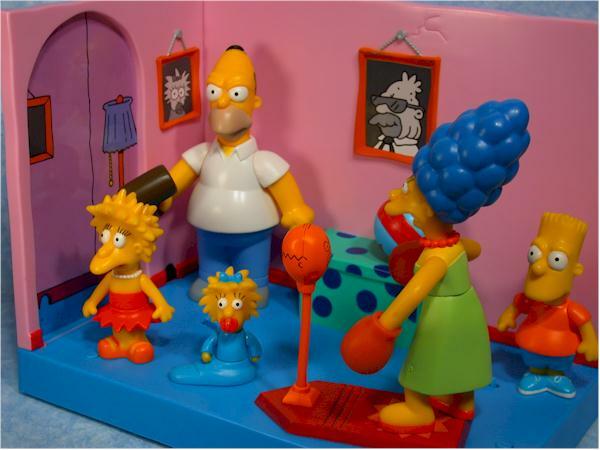 I have covered a ton of Simpsons items over the years - check out this page for a complete list.